The third book of Dillon's set in Longhampton, where the local people are unusually accommodating of dogs and romance is generally in the air! It's also good to have flashes of Longhampton's other residents who have featured in previous novels, it's comforting to know they're doing okay after their own happy ending! 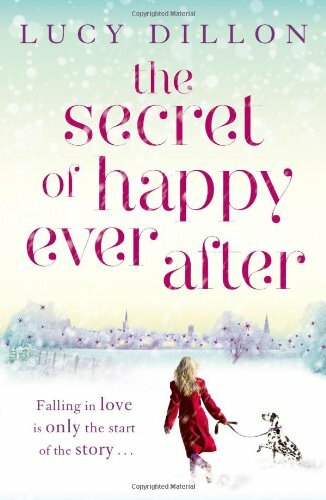 I love Lucy Dillon's books and had purposely saved this to read over Christmas, expecting a well written but cosy, heart-warming story to delve into, and as the beautiful cover (they always are good!) predicts, that's just what you get. Anna is struggling to be a good step-mum to husband Phil's three daughters and manic dalmatian, Pongo. Anna has recently lost her job in the local library and relies on her love of books and the fictional comfort they provide whilst she juggles the dancing classes, Britain's got talent auditions, GSCE and A-level revision by always putting herself and her broodiness last. Her high powered friend, Michelle has sold her flashy car, left her controlling husband Harvey and set up the "Home Sweet Home" shop in the high street to provide lifestyle goodies to the yummy mummies of Longhampton. Although she gives little of herself away and has no personal life, business is booming and she wishes to expand into the sadly, neglected bookstore next door, but a local solicitor, Rory, soon informs her that the condition of becoming the new tenant is that the shop is maintained as a bookstore for at least twelve months. Never one to miss an opportunity, Michelle offers Anna the chance to manage the bookshop and plans to slowly shift her home stock into store as book related extras, to prove that book selling isn't a viable option long term. Unfortunately, she doesn't let Anna know of this plan! Anna pours her unfilled love for her own baby into the bookshop and it becomes a focal point for the community. Throw in a couple of unexpected pregnancies, a needy and much-aged dog and the mix is complete. What I loved about this book, and it shouldn't come as a great surprise with my massive reading habit, is the genuineness of Anna's affection for literature, particularly children's classics. The author interview at the end and aspects of Anna's childhood did more than strike a chord - I was that child too! I still go back to my childhood favourites for comfort and pure nostalgia; and I do so using my job as a major excuse if anyone is looking! Although I never was a fan of 101 Dalmatians, I loved all the others and maybe will do a blog on those another time. The trials and upset of being a new step-mum is believable and well written, Anna's sense of isolation and frustration is real. I actually liked Chloe at her most horrendous and extreme drama-queendom but didn't really see the point of Phil, he was a bit of a non-event and I never really saw what attracted Anna to him in the first place. Although I really enjoyed this book, what made it lose the star (and I'm really sorry) was the character of Michelle. I just couldn't warm to her; I thought she was pretty horrible and so undeserving of Anna's time and understanding that I didn't actually feel she needed her "happy ending". I get that she was control-freaky to protect herself, I got that Harvey was horrible and I still hated her mother, even after she finally saw the light...but what I couldn't get was how the grim events at her boarding school could be held over her for so long and be used by Harvey to manipulate her. I understand that what happened would be horrific for any woman and that the trauma would effect her ability to move on but just didn't feel her responses not only to Harvey, but to her family and future friendships were particularly realistic, or maybe I had just created an even worse possibility as I went through the book? Maybe I'm just being harsh and hate people with perfect houses?!! So sadly, that made it a slightly less than perfect read for me, but I always look forward to Lucy Dillon's books and can't wait for the next one.